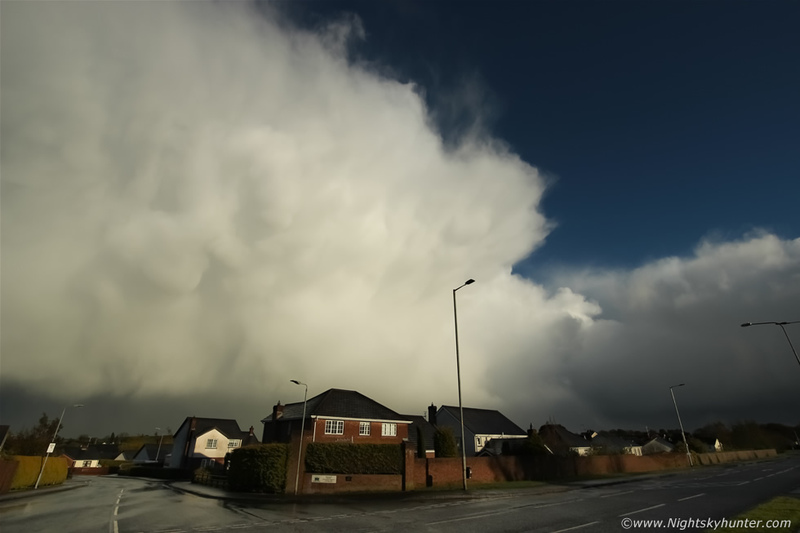 Dramatic weather photo opportunities can happen even with low risk convective set-ups for those who are dedicated and always scanning the skies for the unexpected, Monday May 2nd 2016 turned out to be one of those days. For most people the weather was very unsettled however for the convective coinsure there was potential brewing thanks to cold upper air overspreading N. Ireland during the afternoon and evening hours in an unstable NWly flow which would generat scattered heavy showers with a low chance of thunder and despite the suppressed temps there was an abundance of strong May sunshine heating the ground to enhance lift, however the biggest draw back was the low CAPE. The far N and NW coastal areas had the best chance with GFS indicating 100 CAPE across these areas between 18.00 and 21.00 UT with inland areas beginning with 100 CAPE and quickly dropping to 50 or less by late evening, however any storm photographer should never be snobby when it comes to CAPE values for dramatic scenes can happen at both ends of the scale so the best thing to do, as always, is watch the radar and watch the skies. I spent the day in Cookstown working on the computer while periodically refreshing the radar as I normally do, Roisin was working on her University assignment so the house was quiet except for the regular blasts of wind which rattled out from the NW, I really wanted to take the Phantom out for a flight however the wind kept me inside so I spent half an hour sharpening my skills using the simulator via the DJI app then got back to the lap top. The day was very sunny with occasional showers however by late afternoon the clouds outside were starting to get my attention. It got to the stage where I was checking the upstairs and downstairs windows every 10 min's just in case an opportunity presented itself. Those showers were getting bigger and more picturesque with lovely white tops against a blue sky, some had subtle mammatus and some had unimpressive bows, but that was only because the sun was still high in the sky, my instincts were telling me that something was brewing and if these showers kept building and I was lucky enough to get one pass over here before sunset then perhaps I could be in luck, the camera bag was already on the floor beside me just in case. By early evening a big thunderstorm had grown over the ocean to the NW of Donegal and was moving E producing a cluster of c-g lightning bolts over the sea and the radar showed showers inland getting stronger so I made a mental note to be extra vigilant. Roisin and I had dinner then got back to the lap top when the latest radar scan showed a line of heavy showers to the W moving SE in the general direction of Co Tyrone and judging by their path they looked like they could hit Cookstown within half an hour. 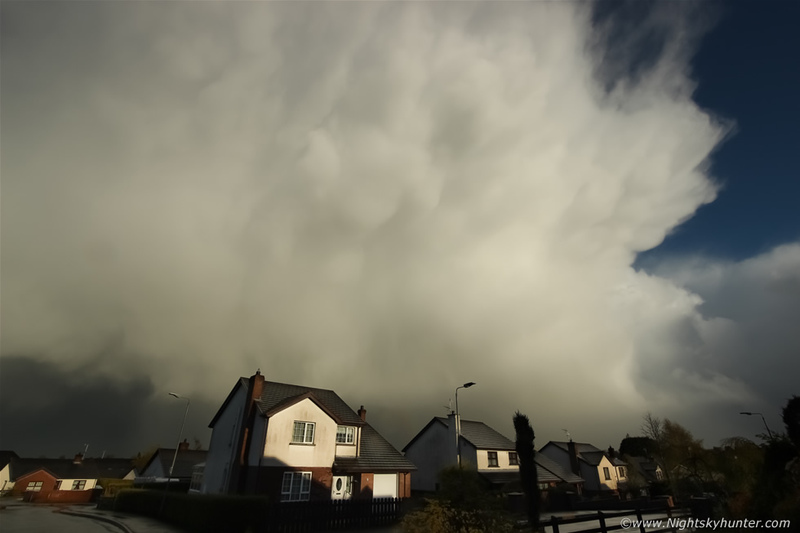 Ten min's later my mobile rang, it was photographer John Fagan from Dungannon, John said he could see the cells from Dungannon and they where heading my way and he remarked about them having ''a class anvil on them'' so that got my interest. 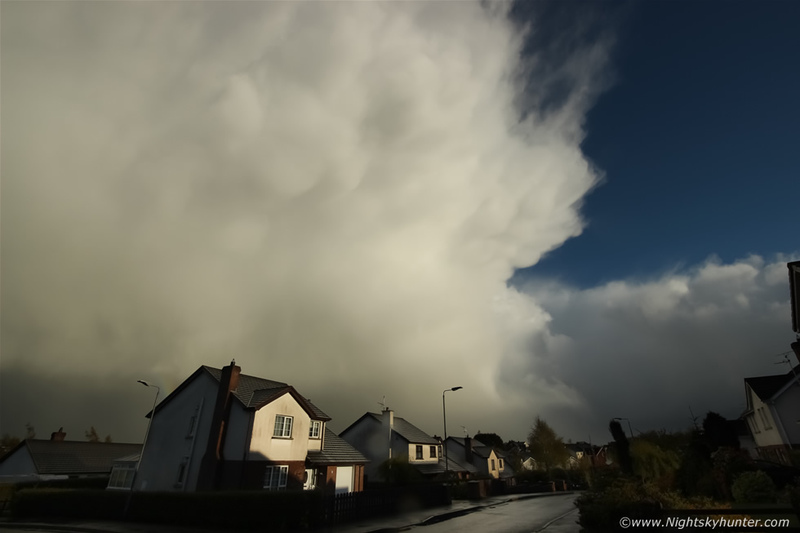 Cookstown suddenly got hit by heavy rain which lashed the windows hard for 15-20 min's however I began to sense the rain was getting brighter and that the source of this downpour was about to reveal itself. I always check the rear section of passing showers, cells and storms for photo opportunities, especially when the sun is low in the sky, it's a habit that has often paid off for me big time over the years. One last glance out the window and through the rain drops I could see a structure appear in the sky, it looked like the edge of a sharp anvil and the rain was drawing slowly apart like a curtain ready to reveal the show. I knew that something impressive was going to happen so before I did anything else I got the Phantom out from it's case, started it up and got everything ready, all I would have to do was walk outside, calibrate and fly. I opened the back door and my view to the E through the open aperture was simply jaw dropping. The sky had one of the finest primary and secondary rainbows I had seen in years, both bows were complete, extremely bright, and sporting vibrant colours with supernumerary arcs and a high contrast Alexander's Dark Band all set against a black stormy sky of sunlit rain curtains and framed by the door frame. I called to Roisin...''Roisin come here to you see this rainbow now...hurry...it's amazing''...Roisin ran in and was impressed as soon as she saw it and she snapped off a few images with her phone camera. I then decided that I was going to launch the Phantom, this spectacle from the air was going to be truly epic, I began to shake with excitement and anticipation of not knowing what the camera was going to catch from high in the air, I was in full combat mode and hadn't a second to waste. When I walked into the back garden I realised this was not going to be a quick process and may not be even suitable for flying at all, the rain was still falling and although it was easing the rain drops were big and soaking everything and I wondered if the craft could take that amount of water, it was risky, I then tried to calibrate - weak controller signal, I turned everything off and back on again...weak controller signal then something about compass error, this was strange because I had launched from here before and never had this problem, perhaps the latest firmware update had something to do with it or maybe it was just enhanced interference in the area at that hour of the evening. It wasn't happening but that didn't matter because once I looked above me my jaw hit the floor once again. 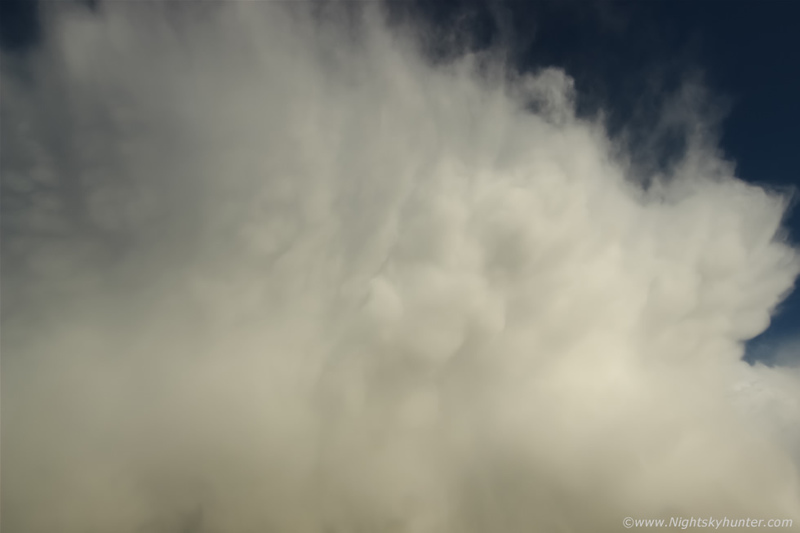 The rain had just cleared and behind the core was a massive anvil far above me and hanging from it was a formation of large and solid mammatus clouds. 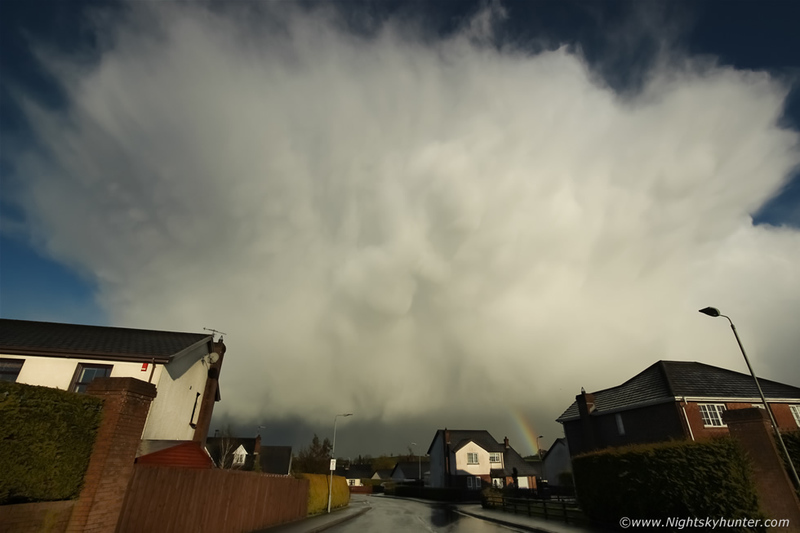 The structure was fantastic with the entire back of the cell, anvil and mammatus all lit into brilliant white by the low sun angle which produced an extremely dramatic high contrast scene. 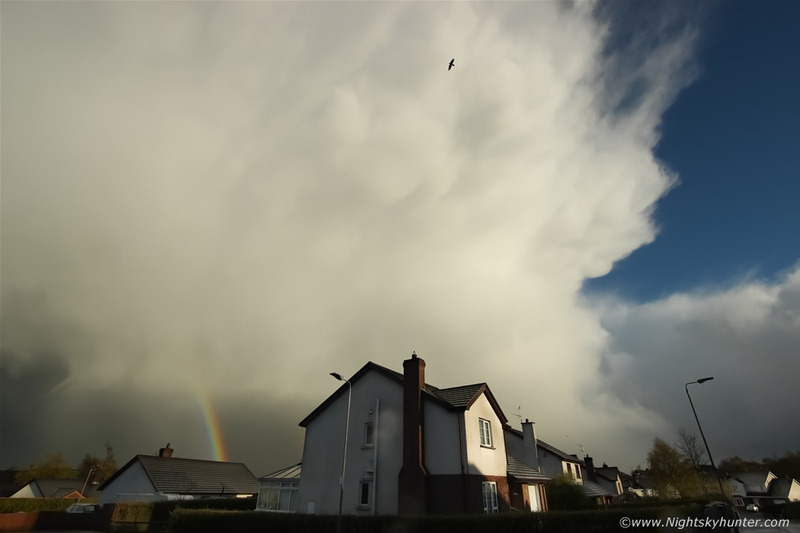 I shouted out to Roisin ''holy S**t come out to you see this anvil! '', I didn't waste another second, I ran into the kitchen, left the Phantom switched on and grabbed my camera bag and ran outside into the estate which is from where I took the following images, these are all 10mm wide angle with the Canon 600D. The anvil was huge, solid, and looked an awesome sight towering far above the houses and completely surrounded by clean blue sky and clear air which made for perfect photography conditions, the time was just after 19.00 UT. Remember 10mm and I can't fit the entire structure into the frame, there was just as much of it visible to the left hand side too, I began clicking away at ISO100 F/8 to F/11, the clouds were reflecting so much sunlight I had to stop down this far. Segments of the primary and secondary rainbow were still visible which complimented the scene, note the slanted hail streak to the left, some mistaken these for funnel clouds and from a distance this can be an easy mistake to make, it caught my eye at the time however I never saw any rotation, in truth it was a narrow curtain of hail catching the sunlight at the back of the precip core. Tilting the camera approximately 70 degrees upward here towards the top of the anvil, can you appreciate how big this was?. 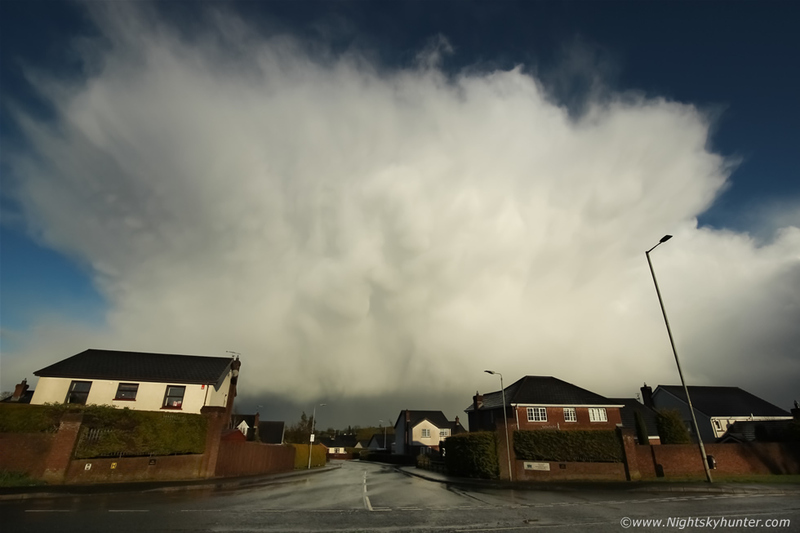 This cell actually reminded me of a similar scene I captured from Maghera back in September 2006 (report). Hard to believe this was only 50 CAPE or so, perhaps the instability had got upgraded since the last run however in any case it is still a low value in comparison to the 1000-2000 CAPE we get in prime Summer, however this scene had beat hands down many of those big storms, I was impressed by the full vertical extent of the anvil and it's structure. Normally I would have loved to have captured this scene over a country location or a lake however I have to say the houses really do add a tremendous sense of scale. I backed further along the estate, crossed the main road and continued shooting from the pavement, now the cell had moved far enough into the E to get the entire anvil in the frame, this scene blew me away, it surpassed many a good summer thunderstorm for structure and quality. Solid storm cell, anvil, mammatus with blue skies is a combination which is hard to beat, the time was now 19.20 UT, I had been shooting this for 20 min's and yet it only seemed like 5 min's to me. There were people walking along the foot path wondering what I was doing, I don't think any of them even looked up at the sky to see this spectacle. 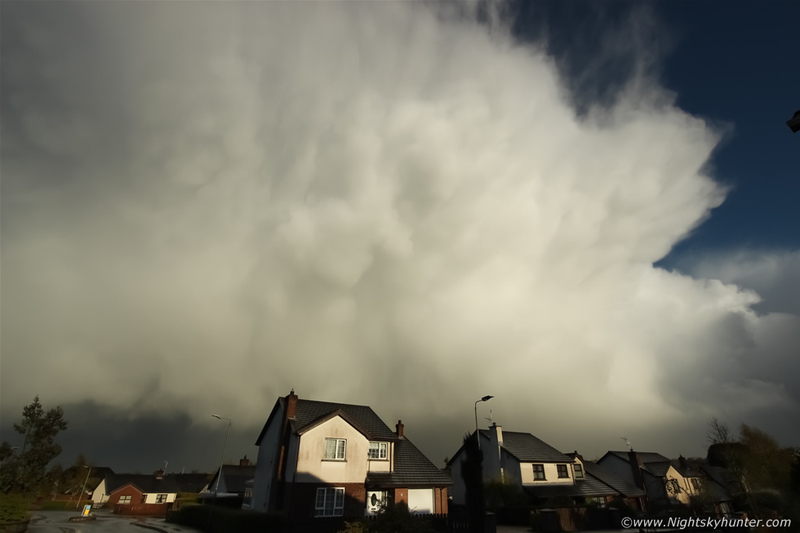 Stunning Cumulonimbus Incus dominating the sky as it moved over S. Cookstown into the Co, Tyrone countryside. This is why the flanking area of storms are my favourite places to be, they can have great storm structure, rainbows, mammatus, flanking towers and even funnel clouds or tornadoes, what a way to end the day, but wait a minute, I just remembered the Phantom was still powered up in the kitchen, the cell was moving further away but still stunning, the rain was gone, was there time to get in the air and film the back of this?, I ran back through the estate into the house again. I grabbed the Phantom from the kitchen and walked into the back garden and calibrated, yet again weak transmission signal, turned craft off and on again, this time it worked however there was no GPS, the craft went to atti mode which meant I could still fly however the craft would drift in the wind and not hold its position, this was not ideal as the wind was still blustery so I tried calibrating again and this time I got the green safe to fly and full GPS and I lifted upward, shuffling left and right to avoid the clothes line then climbed above the roof tops and hovered at 100m high and took in the view. The cell was miles away now however it still looked great and being able to view it with the Phantom was a final exhilarating pleasure of such a great scene. I landed, the sun was shinning in blue skies and I returned back inside glowing from watching such a wonderful scene from Mother Nature. This is a still from the video taken from the Phantom's 1080p 60 frame/sec camera, if only I had this bird in the air when it first appeared, my goodness that would have been some view. 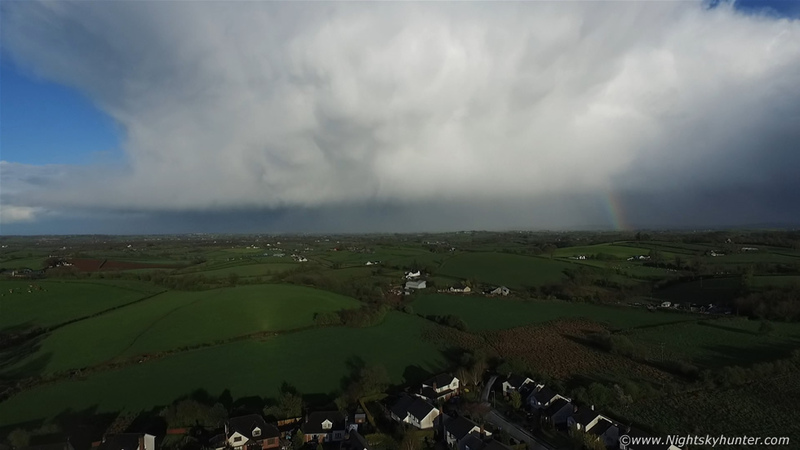 Video clip of the Cookstown cell taken with the DSLR and 10mm lens then the Phantom 3 Advanced. At the time of writing the models are showing potential for a mild to warm spell of high pressure weather moving in for the next week or two and with it may be the potential for warm core thunderstorms so stay tuned for future reports. Thanks very much for reading.